Non-medicinal ingredients: microcrystalline cellulose, silicon dioxide, sodium stearyl fumarate. Capsule: hypromellose, gellan gum. AOR™ guarantees that there is not more than 14 mg of S-lipoic acid per capsule, and that all ingredients have been declared on the label. Contains no wheat, gluten, corn, nuts, peanuts, sesame seeds, sulphites, mustard, soy, dairy, eggs, fish, shellfish or any animal byproduct. AOR's Pro Lipoic Acid provides only the natural ‘R' form of this vital antioxidant produced in the body, unlike most alpha-lipoic acid supplements which also contain equal amounts of the synthetic, inactive ‘S' form. Pro Lipoic Acid helps to promote healthy glucose metabolism to avoid insulin resistance; which prevents diabetic complications such as neuropathy. R(+)-Lipoic acid provides powerful antioxidant protection and supports a healthy aging process. It improves energy production, reduces the buildup of iron in the brain, reduces fatigue, protects the liver, and functions as a lead chelator. R(+)-Lipoic acid may also benefit glaucoma patients by improving visual function and reducing the risk of cataracts. AOR's formula is designed to deliver all the benefits of R(+)-lipoic acid without interference from S(-)-lipoic acid. Pro Lipoic Acid offers a high dose and more servings per bottle, for flexible dosing options customized to your needs. 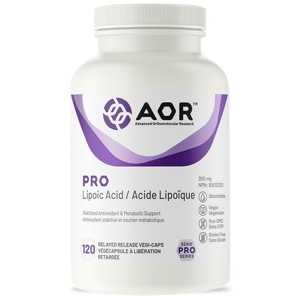 AOR's Pro Lipoic Acid is in time-release capsules to enhance its stability and effectiveness. Adult Dosage: Take 1 capsule twice daily with/without food.. Cautions: Caution in patients with diabetes. If you experience sweating, paleness, chills, headaches, dizziness and/or confusion, discontinue use and consult a health care practitioner as these may be symptoms of serious low blood sugar.